Example from . Yoshida Shrine 吉田神社 - Kyoto . 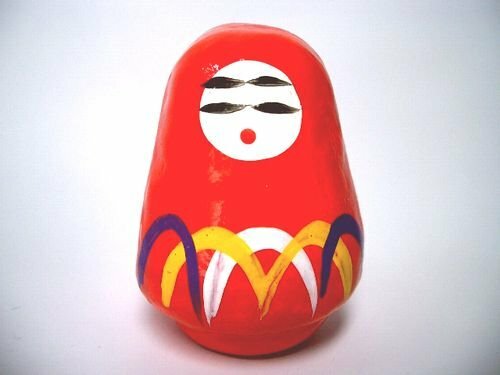 The paper with the fortune telling text is hidden inside the small figure. You have to tear off the bottom paper to see your future. Generally known as o-mikuji, these messages written on a thin piece of washi, replies from Shinto or Buddhist deities, are used to tell the fortunes of those who visit shrines or temples with their problems. The visitor draws a numbered stick from the small opening at one end of a prism-shaped container and exchanges the stick for a mikuji of the corresponding number. 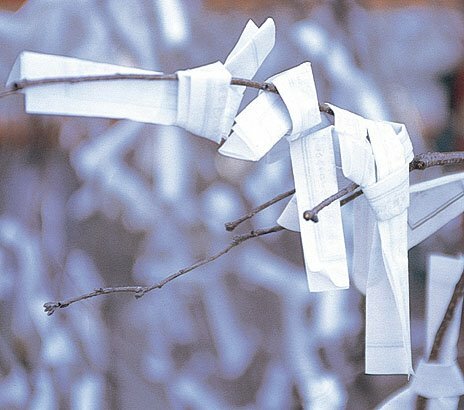 If the fortune is less than favorable, the visitor customarily ties the mikuji around a tree branch or in a designated location near the temple or shrine in hope that circumstances will eventually improve. Kansai International Public Relations Promotion Office. 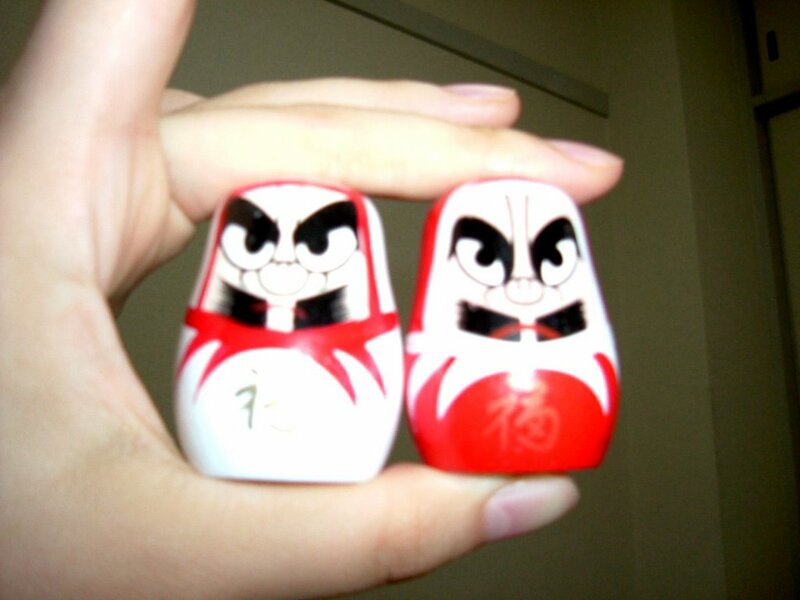 The Daruma Mikuji also come as small wooden figures. 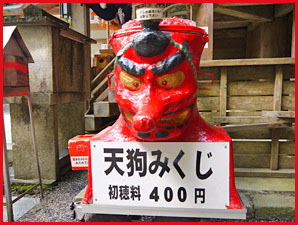 This one is from Temple Manpuku-Ji. In Tamba, famous for its hydrangea, ajisai. The American version, fortune cookies ! This is a non-seasonal topic for haiku too. 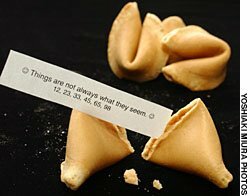 What's really 'Chinese' about fortune cookies? Try this for fun next time you're in New York City: Walk into any sushi bar, eat your fill and then ask for a fortune cookie. "Would that be a Chinese fortune cookie?" the waiter will likely respond a little loftily. "Sorry, but this is a Japanese restaurant." "Exactly!" you might vouchsafe -- then launch into telling him how the so-called "Chinese" fortune cookie, that ubiquitous American snack that accompanies every order of General Tso's Chicken or Egg Foo Young, most probably came from . 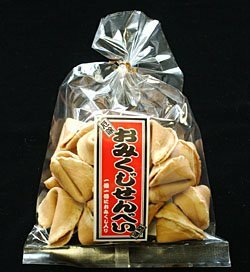 . . Japan, where near-identical tidbits called tsujiura sembei (crossroads-fortune crackers) have been enjoyed for generations. "They've got the same origin," said Yasuko Nakamachi, a Japanese folklore and history researcher at Kanagawa University who is the country's leading authority on tsujiura sembei. "Since this was a product transmitted from Japan, the [tsujiura sembei] and the American fortune cookie are the same." Shaped like an orchid in bloom, and with a sagacious maxim printed on a slip of paper inside, the fortune cookie plays a bigger role in the scheme of occidental life than its tiny size would suggest. And then there was a much-reported lottery early last year, in which more than 100 people across the United States who had played numbers printed on cookie fortunes apparently won in excess of $ 100,000 each. But as life-changing as it seems they may be -- and fortune cookies these days can be found working their tasty magic in the likes of Britain and France as well -- where did they really originate? Some amateur historians maintain that in the 19th century, Chinese workers in the American West celebrated the autumn Moon Festival by exchanging treats stuffed with cheerful messages -- a rough adaptation of traditional Chinese moon cakes. That theory, though, seems a bit of a stretch: Whereas fortune cookies are delicate and crunchy, moon cakes are soft, round and filled with bean paste. Instead, gastronomic sleuths would probably do better to check out Baron Makoto Hagiwara, a Japanese aristocrat who, according to family tradition, was kidnapped from his homeland by pirates and taken to the United States. According to Hagiwara's great-great-grandson, 48-year-old California landscape designer Erik S. Hagiwara-Nagata, his forebear decided to stay on in America, where, with money sent from Japan, he built the first authentic Japanese garden in San Francisco. There, he is said to have offered visitors another New World first: fortune cookies. That was back around 1910, and though Hagiwara may have been the brains, it was the Baron's partner, Suyeichi Okamura, who was the brawn in the bakery behind those historic first batches. That, at least, is how Okamura's grandson, Los Angeles resident Gary T. Ono, explained it in an e-mail to The Japan Times, adding that his grandfather arrived in the U.S. from Kagoshima Prefecture in Kyushu in 1906, and went on to run the Benkyodo Candy Factory there. Indeed, Ono says, he has inherited baking irons identical to ones shown in some Meiji Era (1868-1912) woodblock prints. In addition, he relates an interesting story passed down through his family. It tells of a scene in a Chinese restaurant in San Francisco in the 1920s, when a Chinese man spotted a Japanese-American girl and her friends giggling over the slips of paper drawn from fortune cookies brought in a bag from Japan Town. The man, it seems, asked what all the giggling was about, so they showed him the cookies. Not long after, one of the girls spotted the same man leaving a confectionery shop in Japan Town -- carrying a bag of fortune cookies. Canton-born David Jung, a baker and restaurateur in Los Angeles, is said to have begun making cookies containing paper messages around that time -- though, of course, no one can say he was the man in the restaurant. Whatever the historical import of this tale, it begs the question why no one thought to patent the product. Those times, though, were different. "Business back then was done on a handshake," Erik Hagiwara-Nagata said in a phone interview. What's more, Hagiwara and Okamura may have been reluctant to claim credit for a product with ancient roots in Japan. 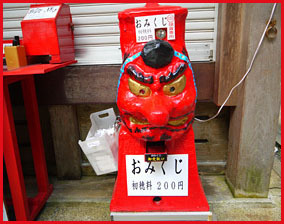 According to "Divinatory, Apotropaic and Fortunate Confectionery," a short history with a long name by Japanese confection maker Toraya, the term tsujiura refers to a method of predicting the future based on the flow of pedestrians at road crossings. It was, apparently, mentioned by chroniclers as long ago as the early Heian Period (794-1185). 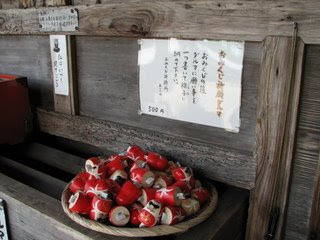 Later, snacks containing tsujiura fortunes are referred to in Edo (1603-1867) humorist Tamenaga Shunsui's (1790-1843) fictional work "Haru no wakagusa (The Young Grass of Spring)," in which a mischievous character named Mamehachi tries to placate a pair of women with tsujiura sembei, which are described as being brittle and containing fortunes. At around the same time, according to the Toraya history book, tsujiura cookies were being swooned over by prostitutes in Edo -- who might well have been yearning for true love to whisk them away from their station in life. Meanwhile, a woodblock print from 1868 that appears in the same book depicts a store selling tsujiura sembei. The cookie pops up, too, in notes by Edward Morse (1838-1925), an American zoologist visiting Japan who described tsujiura sembei in an 1883 Japanese publication as being crisp, sweetened with molasses and "tasting like ginger snaps without the ginger." Sure enough, they had maxims stuffed inside. Nonetheless, exactly why or how people like California baker Okamura came to reinvent tsujiura sembei as fortune cookies remains a mystery. However, confectioner Takeshi Matsuhisa, 30, has no doubt the cookie's distinctive shape is homegrown. 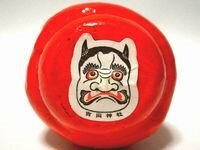 He has been told, he says, that virtually identical nibbles were common in the countryside when his grandfather Kihachi opened the family's Kyoto bakery early in the 1920s. Cookies sold at the shop today have changed little in form. 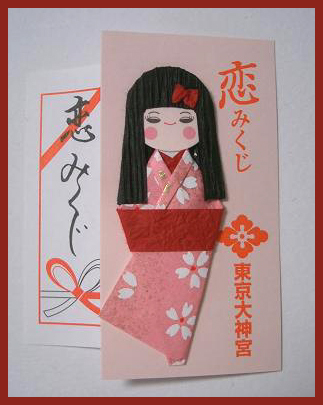 "The fortune cookie," Matsuhisa confidently asserts, "is based on the Japanese model." 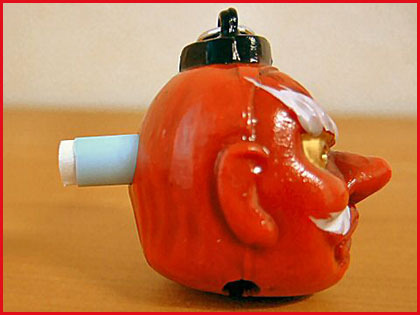 So, there you have it: a revisionist history of the Japanese fortune cookie. Still in the mood for some erudite mischief? Go visit a Chinese restaurant and ask for ketchup. But that story will have to wait until another time. There is even a recipe for Haiku Fortune Cookies! "Haikookies" are fortune cookie-type cookies. "Type 24 haiku onto thin strips of paper. You can use the haiku from the books suggested below, or write your own haiku: three lines long, with the first line 5 syllables, the second line 7 syllables, and the third line 5 again. Put the haiku aside until later. For my haiku project, I decided to make fortune cookies and cleverly insert my haiku inside of them. 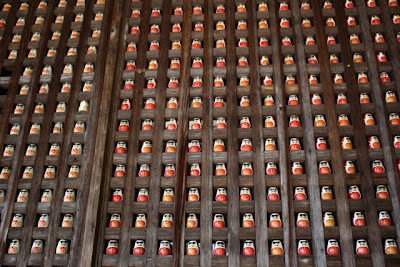 The temple 三宝寺 in Kyoto has about 325 of these wooden dolls in its precincts, maybe the ones with a bad fortune telling slip in them. The priest of the temple cleans them once a year and puts them on the shelf above the well. during the shrine festival at Miho Jinja 美保神社 in Izumo.
. Futomani 太占 divination .
. Sankaku mikuji　三角じくじ mikuji with three corners . fortune inside a dyed Easter egg is a "big yoke"
And there go our dreams of a 'bountiful' harvest this year. Thanks Ella, for your uneaten cookie ! 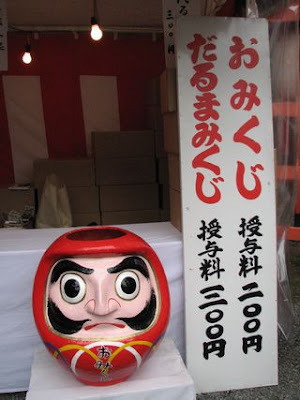 More about uranai in Edo !